Khyentse Özer—Radiance of Wisdom and Compassion was Volume 1 of the International Journal of the Rigpa Fellowship, published in August 1990 by the Rigpa Fellowship in London. Khyentse Özer is one of Jikmé Lingpa's names. Part One: 'His Holiness the Dalai Lama, Historic Teachings in Northern California', News Report. An article on His Holiness' teachings in San Jose, California, in 1989. 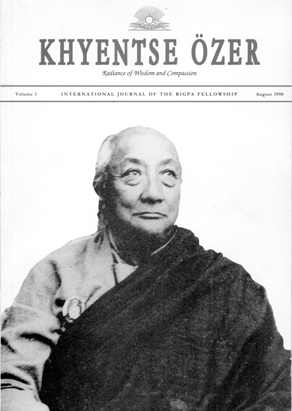 Part Two: 'His Holiness Dilgo Khyentse Rinpoche, A Brief Biography'. This article was based on an oral account given by Orgyen Tobgyal Rinpoche, in Dordogne, France. Part Three: 'The Union of Mahamudra and Dzogchen, Kyabjé Kalu Rinpoche'. This article is based on a teaching by Kalu Rinpoche given at Rigpa Paris (Rue Burq, Paris centre), in 1987. Part Four: 'Beyond Birth and Death: The Key to the Bardos, Sogyal Rinpoche'. An article based on teachings given by Sogyal Rinpoche in 1990 on Rigpa's retreats at Kirchheim, West Germany, on 5 January, and Oakland, California, on 24-25 June. This page was last edited on 20 August 2009, at 17:39.